The extradural anterior clinoidectomy (EAC) is a key microsurgical technique that facilitates the resection of tumours located in the parasellar region. There is currently no consensus regarding the execution of the procedure via extradural or intradural nor scientific evidence that supports its routine use. 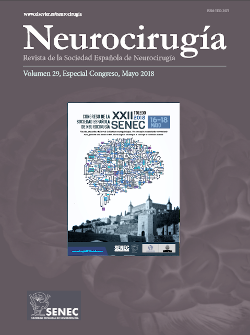 The purpose of this article is to expose our experience in performing EAC as part of the management of the parasellar meningiomas. A retrospective analysis of the EAC for parasellar meningioma resection performed in our centre between 2003 and 2015 was done. A total of 53 patients were recorded. We analysed our series focusing on visual outcomes, resection rates and complications. Through an extensive bibliographic research, we discussed the advantages and disadvantages of the EAC, technical considerations, comparison with the intradural clinoidectomy and its visual impact. The most frequent tumours were anterior clinoidal meningiomas (33.9%). The most common initial symptoms were decreased visual acuity (45.3%) and headache (22.6%). A gross total resection was achieved in 67.9%, being subtotal in the remaining 32.1%. Regarding the visual deficits 67.9% of the patients presented clinical stability, 22.6% improvement and 9.4% worsening. The degree of tumour resection did not significantly influence post-surgical visual outcomes, either visual acuity (p=0.71) or campimetric alterations (p=0.53). 24.5% of the patients experienced III nerve transient paresis and 1.9% permanent. The postoperative cerebrospinal fluid leak rate was 3.8%. Mortality rate was 0%. The mean follow-up was 82.3 months. In our experience, EAC is a safe technique that facilitates the resection of the meningiomas located in the parasellar area, helps to achieve early tumour devascularisation, reduces the need for retraction of the cerebral parenchyma and could play a positive role in the preservation of visual function and the appearance of tumour recurrences in the anterior clinoid process (ACP). El tipo de tumor más frecuente fueron los meningiomas de clinoides anterior (33,9%). Los síntomas iniciales más frecuentes fueron la disminución de la agudeza visual (45,3%) y la cefalea (22,6%). La resección tumoral total se consiguió en el 67,9% de los casos, siendo subtotal en el restante 32,1%. Con respecto a los déficits visuales, el 67,9% de los pacientes presentaron estabilidad clínica, el 22,6% mejoraron y el 9,4% experimentaron empeoramiento. El grado de resección tumoral no influyó de manera significativa en los resultados visuales posquirúrgicos, ni en la agudeza visual (p=0,71) ni en los déficits campimétricos (p=0,53). El 24,5% de los pacientes experimentaron paresia del III par transitoria y el 1,9%, permanente. La tasa de fístula de líquido cefalorraquídeo postoperatoria fue del 3,8%. La mortalidad fue del 0%. El periodo medio de seguimiento fue de 82,3 meses.